Part of the holiday season for a lot of people is going to see (or even to perform in) The Nutcracker. It’s fun to read the story even if you don’t have access to a ballet company or another way to watch it live. 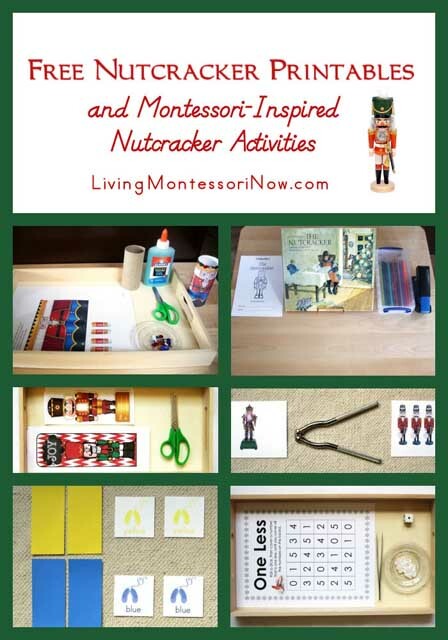 To extent the fun of that story into learning time, Deb from Living Montessori Now has collected a bunch of Nutcracker printables and activities you can use at home or in your classroom. Wouldn’t it be fun to have a Nutcracker day, where you would read the story, listen to the music (and dance, no doubt), color your own nutcrackers, use real nutcrackers as a greater than/less than sign, make puppets and more. You could even have nuts for a snack if no one is allergic. Do you do any Nutcracker-related activities in the holiday season? I’d love to hear about it.